Our Launay Gold project lies 80 kilometers northwest of the city of Val d’Or, Quebec, in the famous Abitibi Greenstone Belt known for its rich gold mineralization. The property is 100% owned by Melkior. In November 2013, Melkior entered into an option and joint venture agreement with Beaufield Resources Inc.. Under the terms of the agreement, Beaufield will have the option to earn an interest of up to 50% in the Project by incurring exploration expenditures aggregating $1,250,000 over five years, with a minimum $250,000 of exploration expenditures in the first year. Beaufield will earn 10% interest for each $250,000 of exploration expenses. Launay Gold represents a near-surface gold deposit. Over 40,000 meters of drilling has shown two main gold zones with large tonnage, low-grade potential. The depth potential has not yet been evaluated. The property has easy road access and there is a large local workforce skilled in mining, exploration, and gold processing nearby. Samples have shown no arsenic (which frequently accompanies gold), meaning the processing of the gold would be more environmentally friendly and efficient (over 87% gold recovery or more). Gold was first discovered at the Launay property in 1937, where early explorers dug trenches and shallow shafts to explore the extent of the gold mineralization. Melkior, through a predecessor company, first acquired an interest in Launay in 1986 and has maintained and increased its interest. Current day exploration of the property has shown the presence of a major deformation zone, the Macamic fault, which is believed to be a slip fault associated with the Cadillac and Destor-Porcupine faults which host world-class gold and base metal deposits. Since then, over 40,000 meters of drilling has identified two main gold zones. Two distinct types of mineralization have been observed on the property, which include ‘vein type’, where the gold is present within veins of shear, breccia and fracture zones, as well as the ‘disseminated type’ where gold-bearing pyrite grains are disseminated in an intrusive massive and plagioclaserich phase. 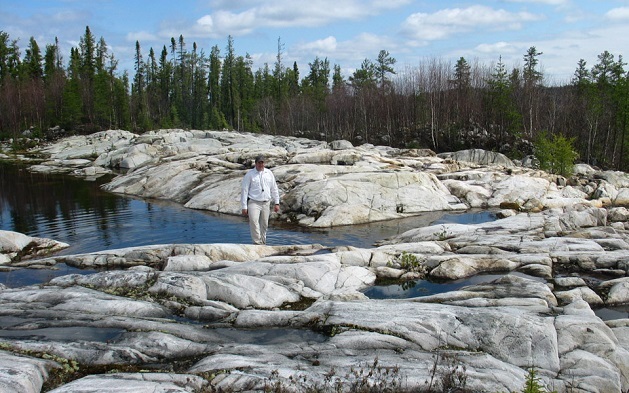 The property contains geological features that are analogous to the Timmins mining camp.